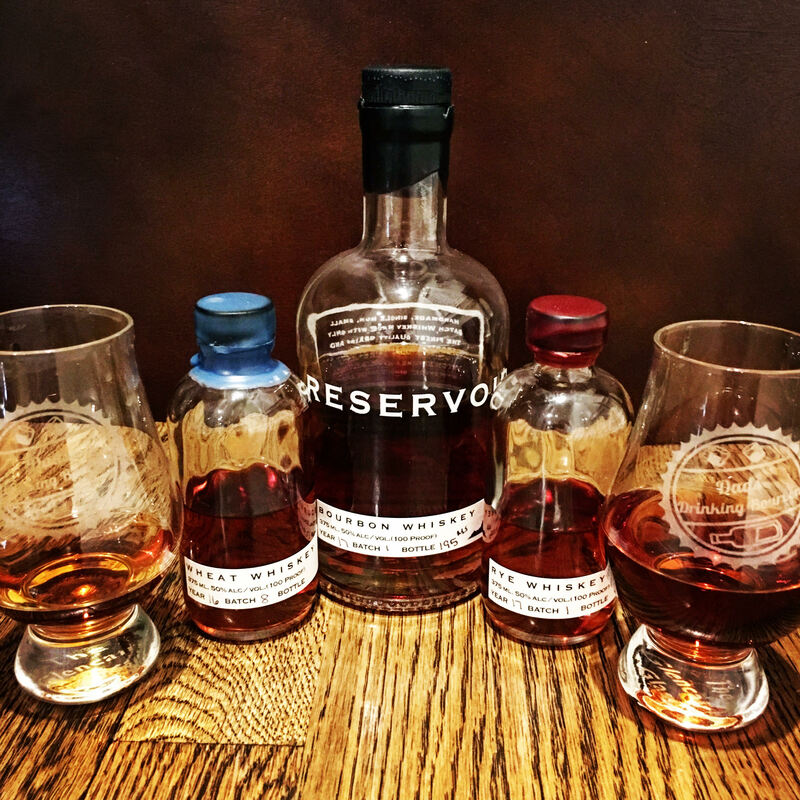 In full disclosure, we received these whiskeys from Reservoir to try and review. However, in no way did that effect our review. We promise to always give you our honest opinion. That’s just what Reservoir wants you to do. Each one of their offerings is bottled at 100 proof and is targeted to be aged for two years. I know what you’re thinking, that sounds like a young offering, but just wait. They don’t age in the normal 53 gallon barrel. They age their whiskeys in ranging mostly from 2-10 (but some 53) gallon barrels which in turn allows them to age their juice more quickly than you would see in a traditionally larger barrel. Through their specialized aging process, they are actually targeting the same result as a 53 gallon barrel having been aged for 15-20 years. A lot of their aging depends on what size barrel it is to get to that optimum result. I spent a long time talking to Dave Cuttino, one of the owners, about this process and I was blown away as to how much care he takes into his process and how much knowledge he has. He was originally a scientist and engineer by trade if that gives you any insight! The idea of them all being the same proof and 100% corn, wheat, or rye is that you can control your own destiny. Yes, now you’re seeing why I took so much time, but this is the choose your own adventure of whiskey. Mix them together in different configurations, add water (if you want), and make the drink that you ultimately want. I only wish that I had an oak barrel at home so I could mix these together and wait to experience what I came up with. Instead, I spent nights becoming a mad scientist. I tried putting in more wheat than rye, more rye than wheat, and always keeping it at 51% corn or above! If you prefer wheaters, you can make it happen. If you prefer high-rye, you can make that happen too. I preferred the bourbon base, with wheat, and just a touch of rye. Though I do have to tell you, skipping the corn base and just doing a wheated rye is pretty damn good. This can be a daunting task, reviewing three whiskeys at once. Here’s how they square up. Some overall thoughts are that the bourbon was smooth whereas the wheat and rye packed a little heat and punch. You definitely felt the wheat and rye in your chest with that amazing hug that let you know that they were there. Though, this can be all to do with my palette and you may get a completely different experience than me. Isn’t that one of the greatest thing about whiskeys?! The bourbon had a definite vanilla on the nose, and the taste was a mix of oak, vanilla, and caramel with a hint of fruit lingering. There wasn’t a great deal of heat, as I had mentioned, even though it’s 100 proof. It makes a great base to mix in the other offerings. The wheat packed a punch – definitely some heat to this one. The taste was as sweet heat, with honey, vanilla, caramel, and a little oak. The rye was hot as well, but that’s what you’d expect from a 100 proof rye. A lot of spice was on the nose with this one. The taste was spicy, peppery, chocolate. The finish remained the same for me with this one. So what’s the ultimate verdict? I would Buy It! For people like me, who dream of one day distilling their own bourbon, this is the closest thing you can get besides working the still yourself. Maybe you go in on these with a couple of friends and you each make your own and try it out. That night you finally tried what you came up with and talked about them would be worth it! I’m a big fan of saying bourbon is all about experiences, and this is a hell of an experience. It kept me occupied and out of trouble for weeks. If you happen to get a chance to head to Richmond, Virginia, I would absolutely suggest heading to the distillery and getting the chance to try things out for yourself. They have programs and special offerings where you can make your own barrel!